Don Wall’s first encounter with the Mint 400 was quite a memorable experience. Rather Wall’s reaction was one of childhood astonishment, stemming from the sheer size of the supped-up off-road rigs parked in downtown Las Vegas and their corresponding larger-than-life drivers. After all, Wall, now the president of SNORE (Southern Nevada Off-Road Enthusiasts) was just a 12-year-old that day in 1979 when he laid eyes on legendary off-road driver Mickey Thompson for the first time. “I was blown away by him, and really everything that was going on with the race. But for some reason the tradition and grander of it all really stood out to me,” Wall recalled on Saturday, during this year's running of the Mint 400. Last year the event — that began in 1968 with Norm Johnson, who was public relations director for the Mint Hotel at the time — returned after a 21-year hiatus. Saturday’s event was moved from the Nevada-California state line to Moapa Valley, a half hour north of Las Vegas, where the original event was held. Wall also wanted to have a major presence downtown and thus had Friday's inspection and vehicle parade on Freemont Street. The harder part was jumping through legislation with the state of Nevada, officials from the Bureau of Land Management, and tribal members of the Moapa. “We’re racing in Nevada, not Mexico. That right there is a huge paradigm change,” said Wall, comparing the Mint to the larger Baja races that take part in Mexico's Baja California Peninsula. “Every bit. I’m so stoked that so many people came out,” said Wall, shortly after a throng of media members, helicopters fluttering overhead and fans cheering on tops of RVs cleared out after Andy and Scott McMillin crossed the finish line roughly seven hours after starting the 400-mile race at 7 a.m. Indeed the scene felt more like the NASCAR event held in Las Vegas earlier this month as thousands of fans lined Interstate-15 to watch dirt devils of all shapes and sizes make their way through the dust and silt of the desert terrain. RVs surrounded the start-finish line while flags and banners of varying truck-part sponsors blew in the very slight breeze. Andy Funk, who used to live in Las Vegas, but now resides in Portland, decided to see what all the fuss was about the historic race. He attend the Shelby 427 at Las Vegas Motor Speedway earlier on March 1 and stayed to watch the Mint 400. He even is sticking around for next week’s NHRA action. “My poor wife hasn’t seen me in a month,” Funk joked. But there was no joking around for a thirsty McMillin, who after pulling himself free from his assortment of harnesses and security devices, he was ready for a “cold one,” rather than the typical energy drink most other motor sports drivers endorse in victory lane. “It’s awesome,” said McMillin, as a buddy passed him a Coors Light. 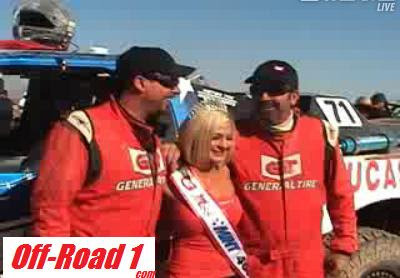 Indeed the McMillin’s, including father Scott, who navigated the truck the first two laps, added their name to a winner’s list which includes their cousin, Mark, a victory of the event in the late 1980s. “We had him out here watching all this before we ever knew if he could drive or not,” chuckled Scott about his son, Andy, who held off second-place finisher, Cameron Steele, despite having to repair a broken drive shaft on the third lap. Las Vegas driver, Rob MacCachren, got the bumpy drive down memory lane he was hoping for — securing a first-place finish in the Class ½ 1600. “This is exactly how I remembered it. The course was very, very silty, making it hard to see. Very rough, but one great ride,” said a smiling MacCachren, who drove solo to claim his third individual title in the event's history. The 44-year-old MacCachren — who finished in front of several higher-class vehicles Saturday — isn’t quite sure which series he will be racing in this year, but said he and his Rockstar Energy Drink/BFGoodrich-sponsored buggy will be a familiar vehicle on the off-road paths of Southern Nevada. So much so that Wall — despite being in charge of nearly every aspect of the 200-plus car field, which will collect combined winnings of more than $80,000 — had to give the course his own seal of approval. “I just had to get out there and see what it felt like,” said Wall, who raced two laps before handing the wheel to his daughter Alyson. BY CLASS: UT, 1, 10, 12, 16, HM, 8, Baja Protruck, 7, 18, 5/16, TL, 9, Stock Full, MM, 7s, 15, 13, 1450, 3, SB. The second edition of the revitalized Mint 400 begins north of Las Vegas, Today. The essence of the legendary desert race took over Fremont Street, Friday. One of the highlights of the original Mint 400, which ran from 1968 to 1988 before returning a year ago, was the convergence of about 500 race cars on Fremont Street the day before the race. That glimmer came back on Friday when the nearly 240 race vehicles entered in this year's event will cruise from 8:30 a.m. to 7 p.m. along Fremont Street in downtown en route to technical-inspection stations near Eighth Street. The original Mint was held in 1968, but interest waned after the sale of the Mint hotel in the late 1980s. Las Vegas publicist Norm Johnson created the event as the Del Webb Mint 400 Off Road Rally, and the Southern Nevada Off Road Enthusiasts organization resurrected it last year. Many teams spent Thursday morning pre-running the 100-mile course, which is about 30 miles north of Las Vegas. The four-lap race begins at 7 a.m. Saturday. The start-finish line is near the Moapa Paiute Travel Plaza at exit 75 off Interstate 15. A brisk, sunny Friday afternoon on Fremont Street might have looked the same 20 years ago as entrants to the Mint 400 slowly pushed their vehicles to tech inspection. Families huddled with their Baja bugs, trucks and buggies. Onlookers gawked at exposed engines, giant tires and shock absorbers taller than some kids. A time traveler might have thought it was 1989, if not for vendors offering racers downloads from Global Positioning Satellites and bodies tattooed more colorfully than most race cars. Times have changed, but the Southern Nevada Off Road Enthusiasts organization opted to turn back the clock last year when it resurrected the Mint 400, which was the country's biggest desert race from 1968 to 1989. This year's activities were expanded further to include the Fremont Street Experience. The last time tech inspection was held downtown, it wasn't under a canopy seven blocks long. All of the nearly 240 vehicles were pushed through the Experience to inspection stations near Eighth Street in preparation for today's racing, which begins at 7 a.m. near the Moapa Paiute Travel Plaza at state Route 168 and Interstate 15 near Valley of Fire State Park. "In its heyday the Mint 400 tech inspection was so popular that kids were even cutting school to gather on Fremont Street," said K.J. Howe, who became the event's race director in the early 1970s. In 1988, Ron Woolworth, now 62, traveled to Las Vegas for the Mint from his home in Riverside, Calif., to help pit for a team owned by Danny Porter. About four years later, Woolworth and his family moved to Las Vegas. His son, Robby, never had a chance to cut school for the Mint's big day on Fremont Street. But he had been going to Southern California races with his father and heard stories about the Mint. "What makes this race so special is its history," he said. "It's exciting to be part of it." Robby Woolworth will compete in a Class 7 Ford pickup he built and uses to promote his Woolworth Motorsports business, which builds off-road vehicles and fabricates parts in the industrial park adjacent to Las Vegas Motor Speedway. Like most involved with the revived Mint 400, the younger Woolworth acknowledges the stature of the new race isn't what it was 20 or 30 years ago. But he doesn't care. It's still the Mint 400, and it's still four laps of 100 miles. At one time it was the world's richest and most demanding desert race. The decline began when the Mint hotel and casino was sold and became part of Binion's Horseshoe. And the desert was more frontier than public park in those days. "The rules and regulations were a lot looser then," Ron Woolworth said of desert races before the Bureau of Land Management became more involved. Most teams, including the Woolworths, will leave town by dawn to begin setting up their pit areas. Thirty years ago, racers and thousands of spectators would have camped out the night before the Mint. Last night, veterans could only dream of those good old days. But for a happily unclean casino executive, the Mint 400 Off-Road Race might not have survived its first year. It was 1968, night had fallen on the 115 buggies and bikes making roaring from the Mint Hotel on Fremont Street out on the dusty acreage between there and Beatty. By then, the desert was littered with racers and their disabled vehicles. It was dark, disorganized, and the race looked doomed before any of the $15,000 in prize money was awarded. One of those people was a Mint Hotel executive Johnson cares not to identify, other than to say the complaining official had the influence to halt the race (pun unintended) in its tracks. “He said, and I quote -- and you can clean this up however you want -- ‘This is a (f-ing) disaster!’ ” Johnson, himself a member of the Mint Hotel family as the casino’s PR man whose dream event seemed about spun out. But one of the drivers who had broken down, a resort exec soon arrived to rescue the event. “An hour later the president of the Sahara, Earl Thompson, and his navigator come in and they’re just filled with dust,” Johnson said, laughing. “He walks up to me and says, ‘This is the greatest Goddamn thing I’ve ever seen!’ That helped change some minds. (Mint Hotel President) Bill Bennett backed it, too. If not for that event, the race might never have made it past the first year.” The event is back, under the Mint 400 title but without Johnson’s involvement. About 225 drivers will charge into the dust devils at the Moapa Tribal Plaza, which is just off Exit 75 about 25 miles north of Las Vegas on Interstate 15 (click here for race info).